We are at the beginning of an epic sail back to Porto. Originally, I thought we would visit certain ports on the way up the river and other ports on the way back, but actually we will be sailing almost straight back to Porto after this morning’s last shore excursion out here near the Spanish border. 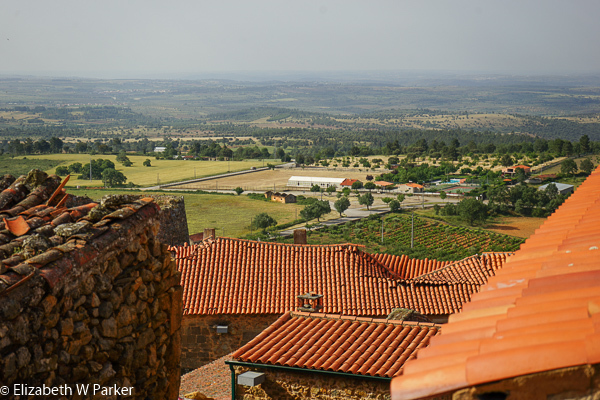 We went to Castelo Rodrigo, not to be confused (as I did) with the Spanish Ciudad Rodrigo! Castelo Rodrigo was a defensive town located, not surprisingly, at the top of a hill. Throughout its history it was sometimes Spanish and sometimes Portuguese, but when the dust settled from the various wars, it was in Portugal for good, and punished for backing the Spanish. Fortunately for the inhabitants, once the wars ceased, they were no longer afraid to live down on the plain where the weather was better and they had more room to farm. The city was basically abandoned at that point. 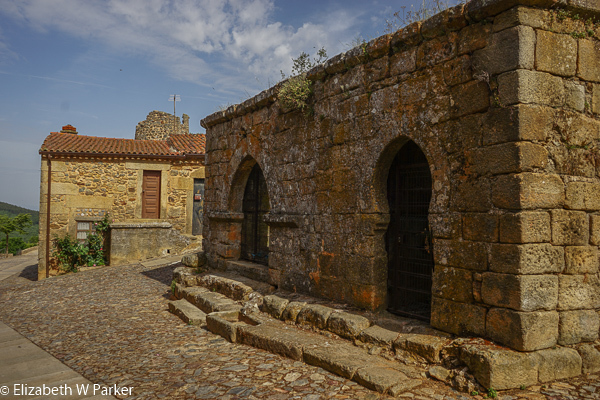 Now, with a population of fewer than 40, Castelo Rodrigo is a wonderfully preserved medieval hill town. 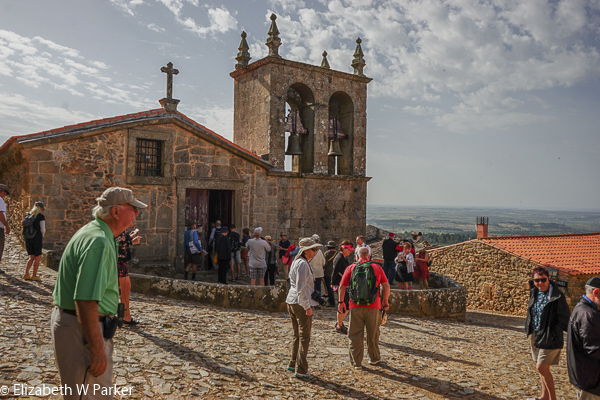 We had a short, guided tour of the town, focusing on the parish church which dates from the 10th century, and an explanation of the trials and tribulations of the Jews in Portugal. The story is interesting – here is a broad brush of a complicated history of seesawing policies regarding the Jews in Portugal. So, the troubles surfaced in 1391, as jealousy engulfed the local people over the economic successes of the Jews. This simmered for about a century, and in 1492 Christopher Columbus’s patrons, Ferdinand and Isabella, expelled all the Jews from Spain. Portugal wanted them, along with their weapons-making expertise because a war was brewing. But, even though the Jews paid to become permanent residents, there were problems – restrictions and reprieves – the seesaw in action. In 1494, Manuel I became king of Portugal and lifted all restrictions on the Jews. However, as part of his strategic marriage to princess Isabel of Spain, she demanded that the Jews be expelled from Portugal. In Castelo Rodrigo, there were Jewish families at the time all this was happening. 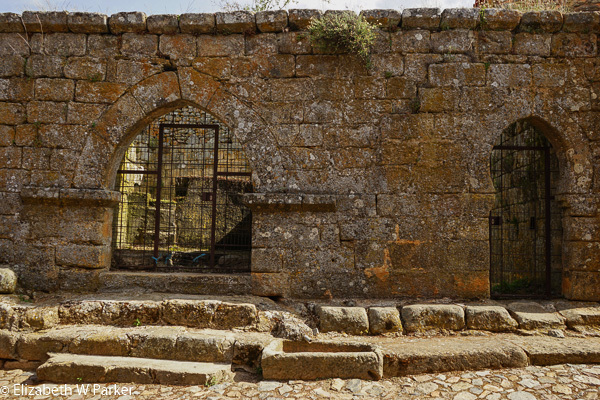 The “New Christians” in the town were identified by Christian symbols carved into the walls of their houses and the carving away of the door jambs where the mezuzah would have been. The town had a mikveh, too. Interestingly, one of the doors had a arched entrance typical of Islamic architecture! There was more time dedicated to tasting the wines and products of the town than there was to touring it, but the views from the hill top were splendid. The only thing I did not see, and which I would have like to, was the palace of the fellow who almost single-handedly made the town a force to reckon with (and who backed the Spanish causing its downfall). The palace is in ruins, forlornly gracing the topmost ridge. Back on the boat, we sailed all afternoon. At 5:00 we were treated to the ceremony of a vintage port wine opening. It was fun, and the suspense … ! The cork is extracted with a special pair of tongs (like a baby with forceps). The thinking behind this is that after so many years, you do not know in what condition you will find the cork and you don’t want to risk the cork crumbling into the wine or, worse, not being able to get it out at all. You certainly wouldn’t push it in! Que horror! Once open, the sediment that has collected in the neck, needs to be decanted separately (the whole bottle would be decanted as well to let the wine breathe). The sediment is a rich dark red color and fairly solid. It is used in cooking special dishes. The decanted wine would be served to us with dessert at dinner time. It was delicious…no doubt about it. Our bottle was a vintage 2007. We are due back in Porto by 1:30 today, so we had a morning of sailing. Most people are packing, but those who aren’t leaving in the middle of the night (that was us) gathered in the lounge to collect email addresses, read, write and catch up on the news from home. 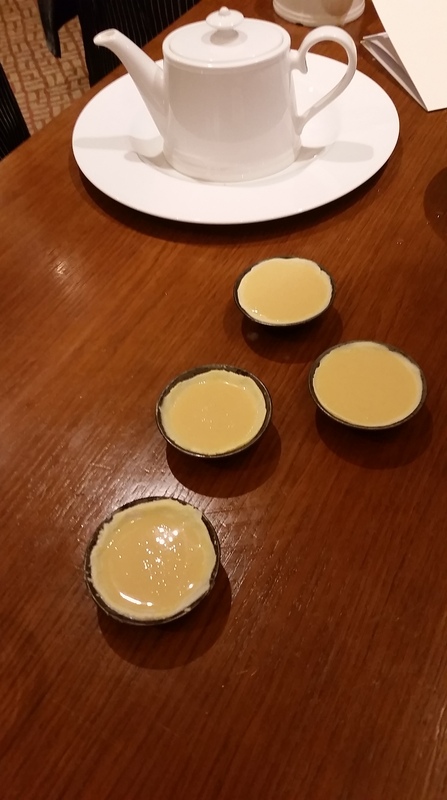 At 10:30 am the pastry chef from the boat gave us a demonstration of how to make the pastel de nata. We made them at our cooking demonstration a week earlier in Lisbon, but this pared down recipe is easier and hopefully equally tasty. I am sure it is suitable for home cooks, and I will try it out on my friends, whether they like it or not. I want to digress a moment here to talk about the locks and the dams again. With five on the way up river and the same five on the way back, the locks were a salient feature of the trip. The process took about 30 minutes each time. We would sail into the lock (fits like a glove! ), the water would fill up or drain out, depending on our direction. The massive doors would open and voila! We’re in a new section of the river. To say that the procedure is fascinating might make you roll your eyes. I will qualify it and say “to some people it may be fascinating.” But that would be quite a few people judging from how many people chose to watch the process each time the boat went through a lock. We were literally elbowing each other for the ringside seats! So, I thought you might enjoy a brief slideshow of the photos I took in the various locks. After lunch on the boat, Gerry and I went on our last excursion, this one to the town of Guimarães. 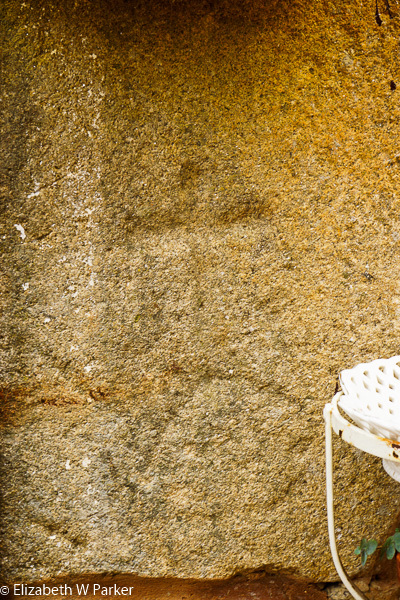 Another old city, Guimarães is extremely interesting and certainly worth more than a two-hour visit. Two hours was enough though to let us realize we will need to come back and explore a bit more. Guess what this is? Or, read the text and find out! 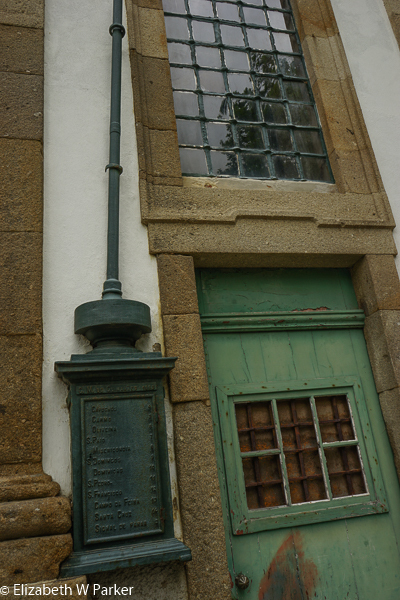 One of the unforgettable things I saw in Guimarães was this green box on the side of a church. In the detail, can you see that there is a series of names followed by a number? Can you guess what this is? We couldn’t! 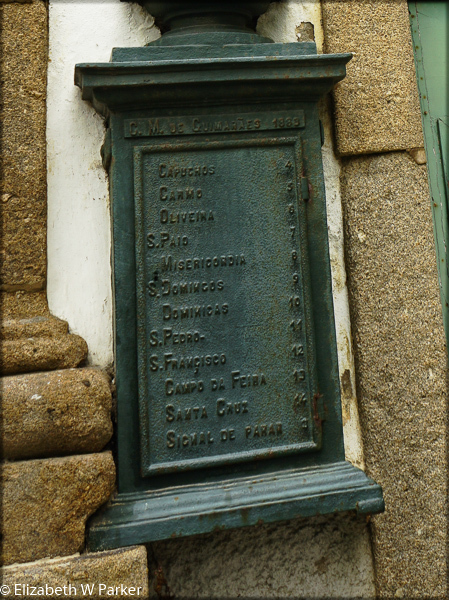 It is a “volunteer fireman’s code box” (I made up that name because I don’t know what the formal name would be…) The names are the parishes in Guimarães. The number represents the number of church bell peals that parish can be identified by. Here’s how it works: Let’s say there is a fire in the Santa Cruz Parish. See the column of names and the column of numbers? The cleric in Santa Cruz will climb the church bell tower and ring the bell 14 times. (See the 14 after Santa Cruz in the list?) He will pause and then repeat the bell ringing. He needs to hope and pray that the wooden bell tower he is standing in is not near the fire – or he may not get through the first sequence, much less the second or the third. He has to keep ringing his code to tell all the other parishes where the fire is and wait for them to get there to help put it out! I did do some shopping here – purchasing a gorgeous blue and silver-grey damask tablecloth. I saw some very fine textiles in the shop where I bought it. Good thing I have a small suitcase… I love textiles! Here are more of the pictures I took in Guimarães. As I said, it deserves much more than two hours and quick walking tour. We were back at the ship at 5:30 and at 6:00 I went up to the sun deck to watch one of the waiters open a bottle of champagne with a saber. The waiter sort of stroked the bottle seam with the sabre (for show?) and then quickly sliced off the entire top off the bottle, not just the cork. There wasn’t much spray. I expected more. Yes, I was impressed. No, I don’t think it is a technique we can use to make our wine bottle glasses! Also tonight, the captain of the ship is taking us for a sail in the Porto harbor out to the mouth of the river and a view of the Atlantic … for most of us this is a view of the Atlantic “from the other side.” We also got a view of Porto from the other side! After dinner, an operatic soprano and her accompanist came to perform for us. Very lovely evening! Almost everyone retired early tonight, after many heartfelt goodbyes. This is the end of the cruise journal, but we spent another few nights in Porto and a last night in Lisbon before returning home to the US. Click here to continue the journal chronologically. And, I revised my opinion on river cruising as a travel option. Click here if you’re interested why.